Welcome to the website for Blackfriars Medical Practice, St Andrews. We hope to provide the best possible service to our patients, and that this site helps our patients to understand the various services we provide. We are confident that it will provide clear and concise help and give our patients the information they require in an easy and convenient format. It has been designed with the patient’s needs at the forefront of everything, from checking surgery times to letting us know what you think of us. 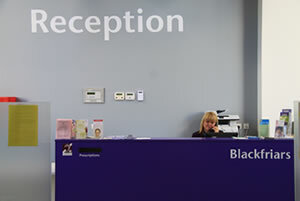 Blackfriars Medical Practice is on one level with easy access for patients with disabilities including the use of wheelchairs and mobility scooters. There are wheelchairs available at the front door of the building for use within the hospital on the day of your appointment. There is disabled parking adjacent to the main door of the hospital. The Hospital is also on a bus route from the centre of town. 11.01.19 Living with Cancer in Fife?